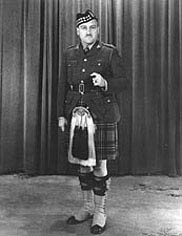 Bruce Macdonald served as a militia officer with the Essex Scottish Regiment from 1929 to 1939, and enlisted for overseas service in September 1939. He served as Company Commander and Second-in-Command until May 1943. Prior to the Normandy invasion, Macdonald conducted a battle school for the training of all units of the Fourth Infantry Brigade. 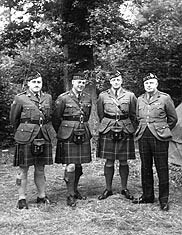 During the early fighting in Normandy, Macdonald served as Commanding Officer of the Essex Scottish with the rank of Lieutenant-Colonel. In August 1944 he served as the Canadian Member of Supreme Headquarters Allied Expeditionary Forces (SHAEF) Court of Inquiry, a post held until the end of the war in Europe. 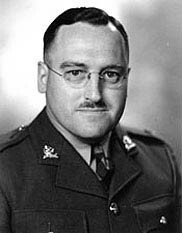 From May 1945 to June 1946 Macdonald headed the Number One Canadian War Crimes Investigation Unit and served as Chief Prosecutor of War Criminals of the Canadian Armed Forces. 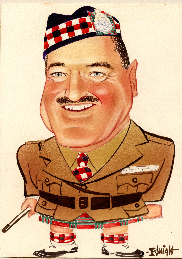 For his service in the Second World War, Macdonald was awarded the Order of the British Empire (OBE), the Croix de Guerre (France) and the Efficiency Decoration. After the War, Lieutenant-Colonel B.J.S. 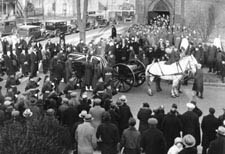 Macdonald was active in a number of Essex Scottish Regimental Associations, committees, reunions and memorials. Field Marshal Montgomery inspecting the Essex Scottish Regiment, 1944. Bruce Macdonald and Fred Tilston at an Essex Scottish Regiment reunion, June 15, 1985.